He points to a couple coming out of a shop and getting into a car. O’Doherty flags the vehicle down and introduces McClean’s parents, Patrick (Waxsy) and Shauna, to the stranger from Dublin. The Irish Independent’s Daniel McDonnell heads to Derry to learn more about Irish talisman James McClean and access isn’t a problem. Andy Watters of the Irish News sits down with old friends Carl Frampton and Paddy Barnes for this very enjoyable Q and A ahead of this weekend’s big Belfast card. 3. ”There was a pause. It was Aug. 9, inside Roger Goodell’s sixth-floor office at the NFL’s Park Avenue headquarters in New York City — down the hall, past the executives’ offices and his assistant’s desk, and through a large, thick wooden door that is both imposing and usually left open to serve as a welcome. Goodell huddled over a speakerphone with general counsel Jeff Pash. On the other end was Jerry Jones. Adhering to the protocol of giving owners a 48-hour heads-up before a major disciplinary issue involving their team is announced, Goodell and Pash informed Jones that after a 13-month domestic violence inquiry, the Dallas Cowboys’ star running back, Ezekiel Elliott, would face punishment — a six-game suspension. Don Van Natta Jr and Seth Wickersham trace the roots of the Roger Goodell-Jerry Jones civil war which is threatening to tear the NFL apart. 4. “It’s not the same as in men’s football. If I watch my brother’s team, they have 25 people around the team and they only have 20 boys. If you compare what we have, and we are one of the biggest clubs in the world, even that difference is there. He’s just a boy who’s 17 years old, he’s not even at the top. It would be amazing if the girls have the same chance as the boys. Jacob Steinberg of the Guardian speaks to Vivianne Miedema who calls for better conditions in women’s football. 5. “In early 2015, three members of the Liverpool scouting department visited the offices of I.S.M. Academy, a small soccer training school in Corciano, just west of here, to speak with a promising teenage striker. The New York Times’ Andrew Keh on North Korean soccer and the challenges facing their players. 6. “Three weeks on, baby steps continue to be taken. The initial shock of temporarily losing total function from his neck down, he says, has only recently worn off. Cian still doesn’t have full feeling, nor does he have full movement. He has limited mobility around his shoulders, while he continues to grapple with his hands for control. On sick leave from his job at the Permanent TSB IT centre at Cork Airport business Park, McWhinney passes the time with a few donations from a nearby creche. ‘I am playing with Lego at home to get the dexterity back in my fingers. It sounds silly but that is what has to be done. I can’t even play the PlayStation. The hands are the main problem. Eoghan Cormican talks to Cian McWhinney of Nemo Rangers for a piece in the Irish Examiner. 7. 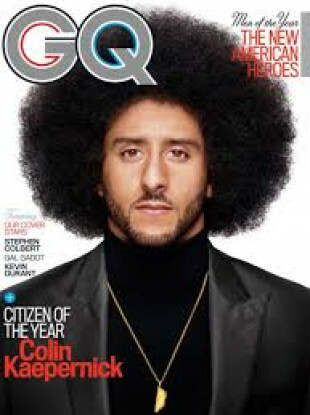 “While much of the focus on the NFL this season has been on the African-American quarterback who is not in the league, it is also important to give attention to the ones who are. As much as Colin Kaepernick deserves to be on a team based on his talent, we can safely say that if he’s been blacklisted from the NFL it is not because he is black. And we can assume this because many of the players who are in the league instead of him – in spite of being worse at football – are also black. Rolling Stone’s Kenneth Arthur on Colin Kaepernick and ‘the NFL’s problematic treatment of black quarterbacks’. Bill Simmons talks to The Atlantic author Ta-Nehisi Coates about the writing process and more in this episode of his The Ringer show. Email “NFL civil war, entering free Derry and the rest of the week's best sportswriting”. Feedback on “NFL civil war, entering free Derry and the rest of the week's best sportswriting”.